President Grover Cleveland was in the White House for eight Christmases, yet it is hard to know whether he sent out White House Christmas cards during his two non-consecutive terms because there was so little written about this area of President Cleveland’s life. White House Christmas cards have been officially sent out since 1953; however, Christmas cards were first offered for sale in America in 1875 and grew in popularity throughout the late 19th and early 20th Centuries. President Cleveland entered the White House as a bachelor who was generally regarded as a robust man who enjoyed beer and a chop. He courted the daughter of his former law partner when she was attending college and proposed to her when she graduated. President Cleveland was married in 1886, at the age of 49 to Francis Folsom at the White House and is the only President to have been married in the White House. It was a small ceremony held in the Blue Room and followed by an intimate reception for close friends and family. This event was commemorated in a Christmas ornament by the White House Historical Society in 2007 with a depiction of the ceremony reproduced from an engraving that appeared in Frank Leslie’s Illustrated Magazine in 1886. Francis Folsom Cleveland was the youngest First Lady at the age of 21 and as a modern young lady of the late 19th Century, it is possible that she adopted the new fad of sending cards and may have sent out White House Christmas Cards. It is doubtful that President Cleveland sent out White House Christmas Cards in his first year of office as a bachelor, but we do know that he did not put up a Christmas tree in the White House during his bachelor days. The first mention of Christmas with President Grover Cleveland was in a Washington Post article that reported President and Mrs. Cleveland spent their first Christmas together at their farm called Red Top (as the President called his wife) with Frank’s mother. The Post further reported that the First Lady had the house decorated with English holly and evergreens and “in one of the rooms a pretty Christmas tree.” The new Mrs. Cleveland had been seen downtown, prior to Christmas, shopping in the crowded shops and she “gently elbowed her way through, and had a pleasant word for the tired shop girls.” The President worked Christmas morning and drove with Mrs. Cleveland to Red Top in the afternoon for dinner with her mother and Colonel Daniel Lamont (the President’s secretary) along with his family. President Cleveland personally wrote envelopes (not White House Christmas cards) for the staff containing a gift of cash for Christmas. The amount was not disclosed. Mrs. Cleveland joined a local club and they provided a Christmas banquet for the poor children of Washington. However, the “official” holiday season did not start until the New Year’s Day public reception, opening the White House winter social season. WASHINGTON, Dec. 26 – The President and the members of the Cabinet spent the day at their respective homes. At the White House it was children’s day. The Cleveland babies enjoyed their first Christmas tree, which was placed in the library. It was beautifully trimmed and decorated. Mrs. Cleveland putting the finishing touches on it. The little ones were the recipients of many presents. Preceding the dinner a luncheon was served to the children of the Cabinet, who came to the White House to see the tree. Mrs. Perrine, Mrs. Cleveland’s mother was the only guest of the family at dinner. Secretary and Mrs. Carlisle probably had the largest family party, entertaining their children and grandchildren. A part of the menu of the Cabinet dinners was ducks killed by the President on his recent hunting trip in South Carolina. The President and Mrs. Cleveland remembered all the employees of the house with turkeys, and the servants received gifts in money. 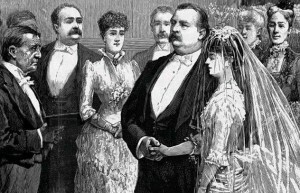 During his first presidential term, Grover Cleveland wed Frances Folsom in the Blue Room of the White House. During Cleveland's second presidential term, they would celebrate Christmas in the White House with three out of their five children. A very important Christmas at the White House was in 1895. President and Mrs. Cleveland had three daughters at the time. The first daughter, Ruth, had a candy bar named after her, although there are many people who contend the Baby Ruth bar was named after baseball legend, Babe Ruth. Esther, the second daughter, was the only baby to be born in the White House. The third daughter, Marion, was born in 1895. The advent of children changed the atmosphere for President Cleveland’s White House. A Christmas tree was erected and decorated with gold angels, gold and silver sleds, lots of tinsel, and the first electric lights to be put on a Christmas tree in the White House. The multi-colored lights replaced candles for the first time. Electric lights soon became popular when people heard that they were used in the White House. Under the tree were dolls, a doll house, and a miniature White House. President Cleveland was born Stephen Grover Cleveland on March 18, 1837 in Caldwell, New Jersey. He was the fifth of nine children born to Richard, a Presbyterian minister, and Anne. Although he was the only President to be born in New Jersey, he grew up mainly in upstate New York. Cleveland and his brother and sisters attended school with supplemental educational subjects taught at home by their father. He enjoyed swimming, fishing, and playing pranks, such as taking the neighbors gates off their hinges. He changed schools when he was 13, eventually graduating from the Clinton Liberal Institute. President Cleveland recalled these years as some of his happiest. The children were required to attend church services twice on Sunday as well as Sunday School. President Cleveland never revealed how his childhood Christmases were spent, but it is presumed that as the son of a Presbyterian minister, they were austere and devoted to prayer and church services following the customs of the time. Grover Cleveland’s plans to go to college were sidetracked when his father died in 1853. He went to work at a blind school as an assistant teacher. He left this job after a year because the superintendent treated the pupils harshly with whippings. Cleveland eventually finished his studies while working in Buffalo, became a member of the bar in 1859, and grew into a hard working attorney. He became a hard working, honest attorney who was well known on the local political scene as a “bulldog.” Cleveland was nearly six feet and almost 300 pounds with a large mustache and piercing eyes. He spent his spare time in local taverns eating chops and drinking beer. He loved to fish and hunt, but he was mostly working. He continued to help support his mother and most likely visited her during the Christmas holidays. There is little doubt that he would not have put up a Christmas tree for himself. Grover Cleveland became active in local politics and was elected sheriff of Erie County, New York in 1871 and served until 1874. During his time as sheriff he carried out two executions himself and kept these from being a public spectacle as had been the previous custom. Cleveland felt that he could not ask another person to carry out any duty he was unwilling to perform. He did not run for a second term as sheriff, feeling it would not be of benefit to his career, so he returned to private practice. Several years later he was chosen to run for Mayor of Buffalo and took office in 1881. He became well known in the state as a reformer and was elected as Governor of New York in 1882, where he worked closely with the young Theodore Roosevelt, a reform minded Republican. Grover Cleveland ran for the presidency in 1884 as a Democrat and won with the backing of the Democratic Party as well as the Republican Party reformers, known as “Mugwumps” – who disliked Cleveland’s opponent, James Blaine of Maine. This turned into one of the dirtiest campaigns in American history and was conducted with more innuendo than substance. President elect Cleveland probably spent a quiet holiday after the election, but nothing was written in the newspapers on where or how he spent Christmas in 1884. 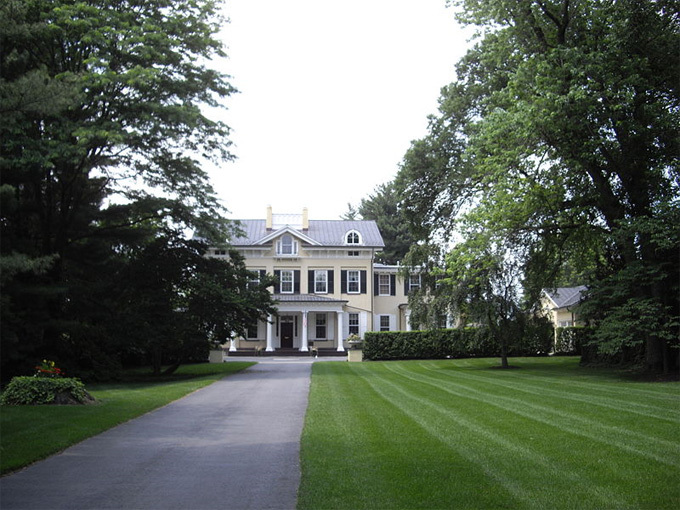 After serving his second term, ex-President Cleveland retired to his Princeton, New Jersey estate, Westland Mansion. His two sons were born here, and together they celebrated Christmas for almost a decade until his death in 1908. On March 4, 1885, Grover Cleveland became the 22nd President of the United States. He entered the White House as a bachelor and his sister, Rose, served as his First Lady until he married in 1886. Cleveland was one of the hardest working presidents and during his two terms of office he vetoed more bills than any other president except Franklin Delano Roosevelt (who served over 3 terms). During his first term of office the Presidential Succession Act was passed in 1886, the Interstate Commerce Act in 1887, and the Dawes Severalty Act in 1887. Cleveland ran for President in 1888 and won the popular vote, but lost the election when he failed to have enough electoral votes. He said, “What is the use of being elected or reelected, unless you stand for something?” He ran again in1892 because he disliked the way President Harrison was making decisions and this time he won, making him the only President to hold non-consecutive turns. 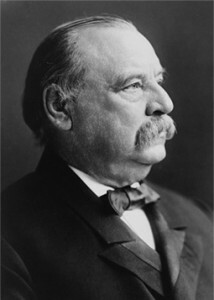 President Cleveland’s second turn of office started off with one of the biggest economic depressions in American history. During the “Panic of 1893,” he was diagnosed with cancer and under the pretext of a trip on the Presidential yacht, he was operated on and a rubber prosthesis was placed in his lip. This operation was kept secret from the public so as not to add the Wall Street panic. In fact, the truth of Cleveland’s illness was not revealed until after his death. While President Cleveland worked long hours and took little time for leisure, even during the Christmas season, First Lady Frances Cleveland took a more active role with the Christmas Club charities in Washington than any other previous first lady. She wrapped and distributed gifts to the poor children and set a tradition of good works that many other subsequent first ladies would carry on during the Christmas holiday. Cleveland lost the backing of his party during his second term of office and he said, “Party honesty is party expediency.” Although he sought the Democratic nomination for President in 1900, William Jennings Bryant was nominated instead. Cleveland was the only Democrat elected between the Civil War and Woodrow Wilson’s administration. President Cleveland retired to Princeton, New Jersey and led a quiet life. His two sons, Richard and Francis, were born here. He was approached by the Democrats in 1904 but turned down the opportunity to run again. Cleveland was acquainted with future President Woodrow Wilson, but they did not like each other. Did I read that right? He was 49 and married a 21 year old? Wow, I would have thought that would have been looked down upon, especially since the people did not live as long as they do now. But, then again, who are we to judge? I’m glad it worked out for them both. Interesting article. I’m glad I came across this site as I was never much of a history buff in school and have more appreciation for it as I’ve gotten older. President Cleveland sounds like he was a good man who enjoyed life and wanted the best for our country.